The one thing I’m learning (and I promise it’s not just one because I’m much smarter than that) is that the road to recovery can be bumpy – very bumpy. On Sunday, I had a really good day and Mama C fell asleep in my room feeling really good about where we were. In the middle of the night though, I decided to spice things up a bit and I found a way to get my tiny little fingers under the tape behind my EAR and I pulled out my central line (central venous catheter). I didn’t really mean to be naughty but I definitely gave my nurses a shock when they came in and saw the blood on my bed. So, the nurses let me rest for a little bit longer, but they woke Mama C up at 4:30am and had her keep me calm while they had to put a new i.v. line in as a temporary solution. I wasn’t happy about that because my veins are really tired and they had to try every single foot and wrist and then go back to the best one and finally get the line in. That was finally done around 6:30am and I let Mama C sleep for 1 more hour and through the nurses change-over, before I made the day nurse, Christina, wake her up again because I had spiked a fever and they needed to do a blood and urine culture, which means more people had to come and poke me. That was all before 11am and so I was very sleepy at that point and I slept and gave Mama C enough of a break to let her get dressed, clean up the room a bit and even put on make-up. Then, Christina and another nurse came back in and they gave us some good news (good news technically but it still meant that I was going to get poked again): one of my chest tubes (draining from where the operation was done, not the fluid around my lungs) and my pacing wires (in case they needed to give me a pacemaker) were ready to come out. 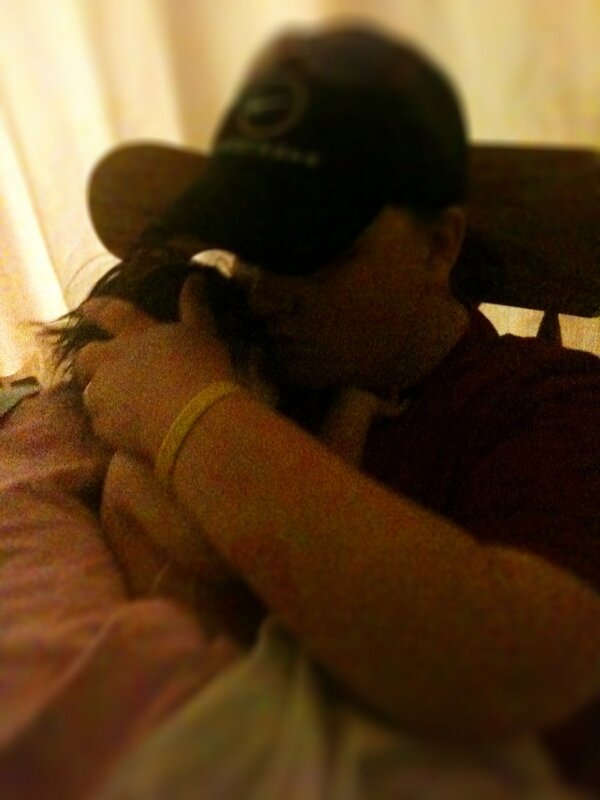 I really didn’t like how they had to do it, but it seemed to go okay and then they nurses finally let me rest. The afternoon is when things got scary (and Mama C realized that make-up was a mistake). I’ve been having a lot of troubles with my tummy and passing gas and trying to poop. I’m on a lot of morphine so it makes everything inside me really hard and so I’ve been struggling a lot and it makes me very upset. Like before, when I get upset my levels drop – it’s because of all the fluid that’s around my lungs makes it hard for me to breathe when I’m relaxing and so much harder when I get all agitated. So, in the afternoon I was trying really hard to poop – I could feel it in my tummy and I got all squirmy and achy and I hurt so much. I finally did poop and it was everywhere: all up my back, on the sheets, on my legs, but it was just the way that I was sitting and it actually wasn’t that much. So I calmed down a little bit but my levels just kept dropping. My nurse Christina asked Mama C to hold me, hoping that it would calm me down, but my levels just wouldn’t come up and that’s when everyone got really worried. In the end, my oxygen saturation level had fallen to 45% (ideally it’s between 90 – 100%) and then everything got very woozy. Christina called Ashley (the boss of the nurses) who took one look at my monitor and yelled for the Cardiac doctor who was working and before Mama C even thought about what was happening, someone had taken me from her to lay me flat on my bed and there were lots of nurses and doctors all around and then someone called for a respiration therapist that they thought could help me. Then someone thought that it was going really badly and they called a Code Blue. I didn’t really know what that means but in the blink of an eye there were a lot more people in my room – some standing on chairs taking notes of what was happening, other’s moving Mama C to a chair so that she was okay too (although I didn’t like that I couldn’t see her). The doctor in charge got upset at that point, because she didn’t think that I needed a Code Blue and all of the worried faces started to look a little better, but they still looked very very serious. They gave me a lot of oxygen and some epinephrine, and a surgeon came up and suctioned my chest tube to get some fiberous crap out of it, to help me feel better right away (someone should have given some to Mama C because at that point she was crying a lot) and it worked because then people started to walk away and I got to be with just Mama C and Mommy (she had slipped in at some point – Mama C looked really happy to see her) and just Christina, Ashley and Cornelia (the doctor). They decided that I needed to go back to the Step Down room for a few days because there are obviously a couple of things that need to get sorted out before I can be okay in my own room. While all of this was going on, they had done a chest x-ray (which was impressive because the whole episode was done in less than half an hour) and it showed that, even though I was draining lots, there was still more fluid all around my lungs and there was even a small pocket of fluid just left of my heart. Once everything was calmed down again and they had moved me into my Step Down room, they came back and did another chest x-ray (on the other side) to make sure there was nothing else going on. That x-ray showed the doctor that the chest tube they just put in (for a second time) on Saturday was kinked again. There was a lot of discussion about what they wanted to do, and they even brought some surgeons up from downstairs and finally it was decided that if my levels stay consistent, they will leave the drain as it is (because it’s still draining, just kinked), but if they start going funny again then they’ll replace it again. The rest of the day, luckily, was very uneventful. I slept a lot and in the end both Mama C and Mommy decided to spend the night with me, even though they couldn’t sleep in the same room as me. I was very kind and let them sleep through the whole night (although rumour has it they didn’t sleep very well). Mommy had to get up and go to work so I only saw her for a moment but Mama C was there with me when the doctors did their rounds. They were still very concerned with what had happened the day before and they’re frustrated that my chylothorax isn’t getting better because that is what’s causing all my fluid problems. So, they decided that it’s been 5 days since they switched my formula and so it’s time to move on to the next step. Sadly for me, the next step is something called complete bowel rest or PN (Parenteral Nutrition) which means that I’m NPO (Nil per os – nothing by mouth) and they’re going to feed me and keep me hydrated completely through my i.v. line, which means everything goes in to my bloodstream and hopefully my body will stop making the chyle that’s causing so many issues. It’s already hard because I’m used to my tummy feeling full and comfortable and this won’t feel that way. They’re going to do this for another 5 days to give it a chance to work before they look at doing something else. The mom’s are a bit sad because they were hoping we’d all be home by the weekend but now I’m going to be there until at least Monday. I also had to go down to surgery today so they could put a new PICC line in (since I don’t have a central line anymore). I tried to stay nice and relaxed all day today to give the mom’s a break (for their poor hearts), so me and Cookie Monster snuggled a lot and even though I was cranky (because I still hurt) my levels all stayed up and that’s good. I don’t want to scare the mom’s like that again. I’m going to tell you a little story. Yesterday morning when they weighed me, I weighed 12.20lbs. This morning, after having a new chest drain put in last night and draining all through the night, I weighed 11.5lbs – that’s more than 1/2 pound of fluid that was just sitting there on my chest yesterday and I’ve been draining more and more all day long. No wonder I was such a mess yesterday! The doctors are still pretty concerned with my breath sounds, because it still sounds and looks like I’m struggling to breath a bit because of all that fluid inside me. And my chylothorax doesn’t seem to be getting better because what I’m draining from my chest cavity is still very milky looking instead of clear like it should be. So, the sign on my wall still says that I’ll be here for at least 3 more days. I know the mom’s are hoping that I’ll be home before the weekend, so I’m trying really hard to give them that, but they also keep saying that I just do stuff on my own time and that my extra chromosome just keeps getting in the way! After my surgery last night Mommy went home because she couldn’t sleep in my room so she decided to sleep in her own bed. She came back bright and early this morning and I was so happy to be so much lighter that I actually smiled for her! (Mama C says that it was just gas, but she wasn’t here to see it and I think she’s a bit jealous because I haven’t smiled for her yet – in fact, she says that I’m a big trickster because whenever Mommy is here by herself I’m really quiet and I sleep a lot but when Mama C is here by herself I’m a bit of a fusspot). In fact, when Mama C came a little bit later (Mommy said that she needed to get some sleep because she looked like someone had punched her) she said that it was like being around an entirely different kid! I still cry a bit when I wake up because I remember that I have all of these uncomfortable tubes, but then I settle down nicely and am happy just to look at the person who’s hanging out next to me or to watch my mobile spin around and around. Today, Grandma and Grandpa came to visit and I was so good for them the whole time! I only cried a little bit and that’s when the nurse came in and started poking me (they poke me a lot!). Then Mommy left for a little bit and brought back my friend Patrick (and Mama C’s laptop), and then I got to meet new people! Mama C’s friends Andrea and Mark came by for a little visit and then even brought me a new friend, baby Alyssa, who is very cute (almost as cute as me!). She was crying when she first came in because she was hungry and had just pooped all over herself and her car seat, but then her Mama Andrea fed her and we just chilled out together. After everyone left, I realized that I had a very long and exciting day. I had a nap after they gave me some medicine for my pain around 11am, but then I didn’t have another nap (I kept thinking the mom’s would notice, but they didn’t, so I stayed awake!) so by 7pm I was sooooo tired but I didn’t know how to fall asleep. I wanted to so badly but I just kept waking myself up and crying and moving around and fussing and crying (it’s because Mama C is her by herself tonight). Finally now it’s 10:30pm and I think that I’m finally ready to give in. Hopefully this will be a nice long sleep, otherwise I might not be the only one crying when I wake up! I’ve had a very long day, which means that Mama C had a very long day too. Yesterday morning I got moved into my own room. I’ve been a little fussy since I came upstairs but everyone thought I was doing really well. M y fever broke and all of the tests checking for an infection came back negative. So, we moved all my stuff over and Mama C set up her new bed because she and Mommy are allowed to stay with me now. In the afternoon Mommy finally got there too and before I knew it I was sleeping in my crib and she was sleeping on the new bed. I don’t know what Mama C did then (because I was sleeping) but I think she went over to Mt. Sinai hospital across the street because that hospital has an Indigo and she wanted to buy some books to read while she’s hanging in my room. Mommy realized that she had to leave and go and take my dog Ellie out because it had been a long time, so she said goodnight and it was just Mama C and I. Our alone time didn’t last for very long because suddenly there was a knock on my door and in walked Auntie CC, Uncle Rico and my Thor!! At this point I had started to not feel so good so I wasn’t very nice company, but Uncle Rico kept me nice and calm while Thor entertained me by playing with my toys and he also tried to help me go to sleep by shaking the Cookie Monster that he bought me over my head so that I had something to look at. Soon visiting hours were over, but Uncle Rico decided that he would stay and hang out with me for a little longer so that Mama C could go and have some dinner. It was nice to hang out with just him because we don’t get a lot of me and Uncle Rico time – I think we should do it more often. Once Mama C had some dinner and Uncle Rico left, we tried to get settled in for the night, but that’s where things started going downhill. I just kept feeling yuckier and yuckier. At first I was sleeping for 2 hours and then I would wake up and just start crying and yelling. Then, as the night got later I woke up more and more often until 5:30am arrived and I just started getting so upset and screaming. Mama C and the nurse tried so hard to make me feel better – they changed my diaper, they gave me extra medications, we tried to snuggle but I was just so upset. Finally another nurse and a doctor came in to see me and they decided that they didn’t like my colour (I was less pink at this time and more purple) and they especially didn’t like my screaming because they were already giving me lots of morphine and so if I was still in pain then something must be wrong. So, the x-ray guy came upstairs and took some pictures and they saw that the fluid around my lungs that they found earlier (the reason I got the chest tube put in) was getting worse because my drain wasn’t working anymore. As soon as they saw the x-ray picture, they figured that’s what was causing me to be so upset because I am just so uncomfortable with all of that extra weight in my chest. Plus, on top of all of that fluid, I’m having some gas problems too so I just have so much stuff that’s stuck inside me. I tried to be good all day because I had so many visitors: Gramma, Kristy and Victoria, my Theresa and then Mee Maw and Auntie Madison, but it just hurt too much. So by the end of the afternoon, I would sleep for no more than 20 minutes and then be all upset again. It would take Mama C a lot of time to help get me all settled again and then the cycle started again. Finally a new doctor came in and took a look at my chest tube and saw that it was all kinked up under my skin. They had hoped that they would just be able to play with it and make it work properly, but in the end it was too messed up. The doctor decided to take me back down to the critical care unit and they did another quick surgery to take the tube out and put a new one back in. Before that happened, Mama C went home with Mee Maw and Auntie Madison so that she could get some sleep because I had kept her up so late (and she was really tired because she cried a few times today – she doesn’t normally do that). They couldn’t put it back in the same place, so they had to make another hole. When they were done, they wouldn’t bring me back to my own room but said I had stay in the Step Down room for tonight to make sure I’m doing okay. Hopefully this means that I will sleep really well tonight and then go back to my own room tomorrow. So yes, it’s been a really long day. I hope tomorrow is better and that I start to really feel better soon. I just didn’t like today at all. I think you guys totally missed me. I totally missed you. Well, really I missed being conscious, but you guys are generally included in that. I’m back! Very very early this morning, before the mom’s even showed up at the hospital, the people who always wear masks came and yanked my breathing tube out of my mouth. I am so happy that they did that – now I can cry again (even though right now I can’t really cry and I’m just making sad noises that sound like the cat when she’s mad at my dog Ellie). For a while they put me in this big brown hood thing that had nice air streaming into it but it was super weird because the only thing I could hear was Mama C talking about some guy named Luke and his father. I totally didn’t get it. For a while this morning they kinda left me alone with just Mama C to hang out and sleep, but when I woke up Mama C had gone to get some lunch and the people in the masks were piling stuff on my bed! I tried to cry and tell them that I wasn’t a big fan of sharing such a little space, but they didn’t listen and just kept piling more stuff on. Then they poked me with (another) needle and gave me some more morphine to help me stay relaxed, but I just kept crying. I calmed down a little bit when Mama C came back, but she just let them pull the sides of my bed up and start walking (so much for being on my side!). I told them that I wanted to stay in the CCCU, that I was really happy with all of the 1 to 1 attention I was getting there but it seems that my opinion means very little around here (but I showed them, don’t worry). Finally, after walking down a long hallways, turning lots of corners (these guys are NOT good drivers) and going into an elevator, we ended up on 4D, which is where we came on the very first day that Mama C and Mommy brought me for my surgery. I saw the nice nurses who still remembered me and welcomed me back. They were being so nice and making my bed so nice and cozy for me (they even used the blankets that the mom’s had brought from home!) that I almost felt a little bad for the fact that I was still crying and getting really really upset. They even made the doctor come in because my colour was looking a little funny and then everyone was all around me trying to give me bum pats and stroke my hair to make me calm down. Eventually they figured out that I was running a big fever and that’s why I was so cranky, so they gave me some tylenol and some ibuprofen and then, finally, they gave me to Mommy who sat down with me in a rocking chair and finally got some snuggling time in. After a little while, Mommy and Mama C traded places and I calmed down even more….for a few minutes at least until one of those mask people came and started poking at me again. It took them a long time to get all the things done that they wanted because I was so upset, but eventually I feel asleep and let them get thier work done. Mommy and I let Mama C go on a nice long break this afternoon (I didn’t understand why should would want a break from me – I just woke up! 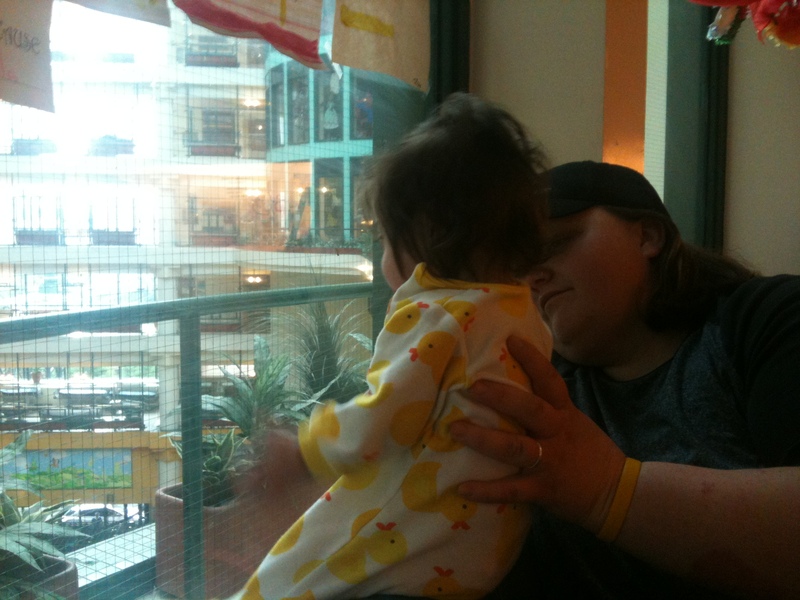 But Mommy explained that she just needed a break from the hospital). When she got back, her hair was all different and s o she and I just hung out for a little while and I stared at her and her hair until I decided to go back to sleep. I overheard one of the nurses saying that they were going to put back in my catheter for a little bit so that they could do a sample and see if my fever is being caused by an infection somewhere, so I decided that I would rather be asleep that unpleasent procedure, so I said goodnight to the mom’s and drifted back off. The best part is that I can sleep super well tonight because I know that I get to snuggle with the mom’s again! It’s good to be back. I walked into Lily’s room this morning and got told that she had an amazing night. 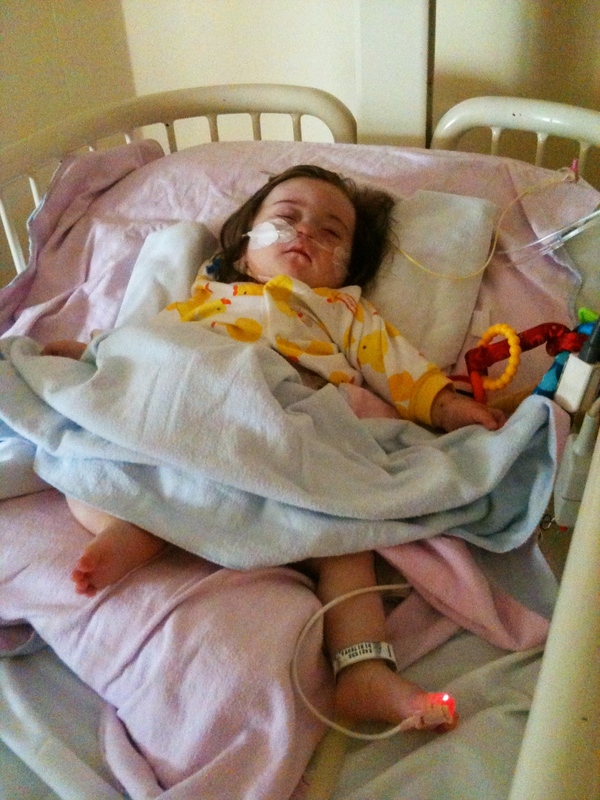 She only needed to be sedated once (as opposed to the 2 or 3 times which had become the norm) and they were hoping to fully pull her ventilation tube that morning. 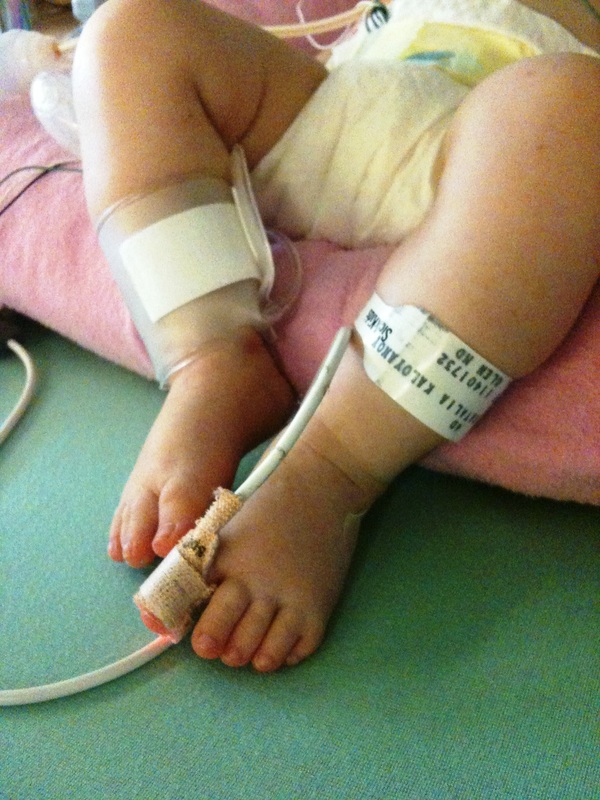 I was shocked and a little doubtful until I looked at her respiration monitor and saw that the numbers we had been hoping for were actually up on that tiny screen. The nurse today, Tori, said that they were just waiting to hear what the doctors said about the chest x-ray she had that morning but that she had stopped feeding her and had already given her half a dose of ativan to get her ready. I was over the moon and Mommy was super excited too when I texted her at work to let her know. While we were waiting for the doctor’s to come back, Tori told me that they had decided to change Lily’s formula during the night because of a problem they had discovered. She showed me her drainage tubes and explained that what was coming out of her was not the right colour and it was pretty high in volume. She went on to explain that they were pretty sure that Lily has something called Clylothorax. The fat from your diet is carried through your lymph system to a vessel – about the size of strand of hair – which dumps the fat into your blood stream. 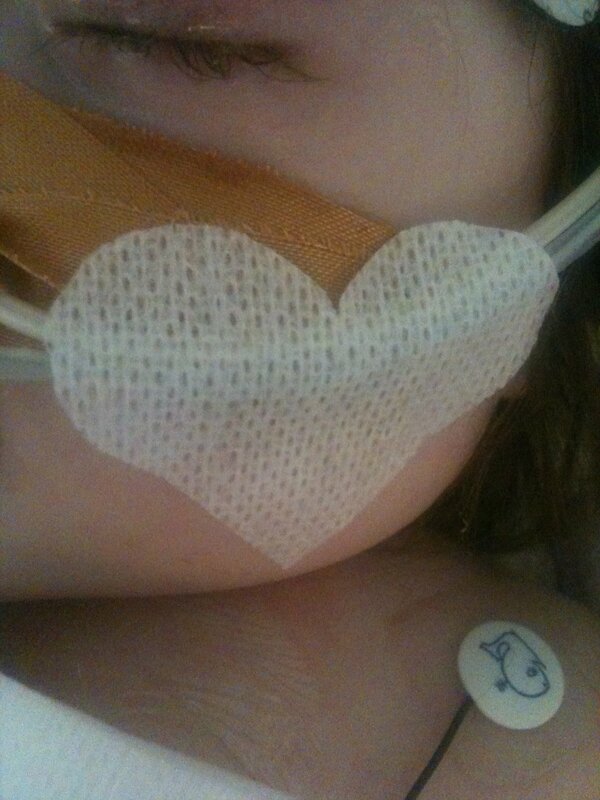 In cardiac surgeries, sometimes this vessel gets nicked and it causes the fat to drip into her chest cavity. The hospital has a specialized medium-chained fatty acid formula (as opposed to a long-chain fatty acid that’s found in store brand formulas) that actually skips that vessel while it’s digesting and avoids this problem. We don’t know how long that will take to heal, so for now we’re on this new stuff. The doctor’s finally came back and told us (myself and Tori) that the x-ray was showing fluid around Lily’s lungs (a plural effusion), which could make it hard for her lungs to expand and harder for her to breathe, so they were opting to postpone pulling her tube until after they were able to do another x-ray and decide between giving her an infusion of a diaretic (if there was only a little fluid and it would help her drain it naturally) or inserting a chest-tube, which would drain the fluid directly. A few hours later, filled with visits from 2 Grandmothers, a Grandfather and an Uncle Jeff, the x-ray was done and the chest tube was put in. At first they didn’t get nearly the amount of fluid out as they had hoped, but then realized that the chest tube line was kinked so they had to redo it. Once it was finally done, the fluid came pouring out and as we left for the night, they were incredibly happy with the day’s progress. In the end, they thought that the Clylothorax was also the cause of the fluid around the lungs (since it had probably been dripping since the surgery 5 days ago). 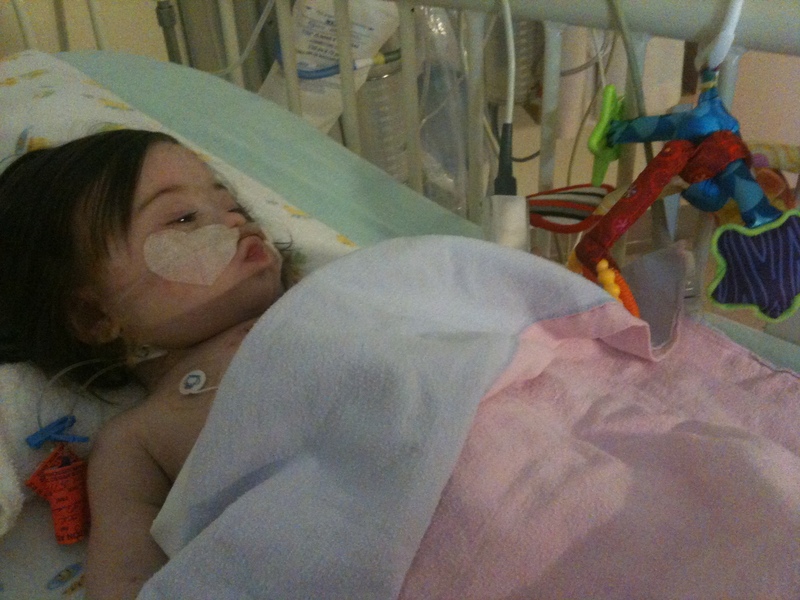 The hope was to keep working on getting her oxygen back to where it was this morning (they had to raise it when they did the chest tube) and hopefully (fingers crossed) pull the tube at some point tonight or first thing tomorrow. We’re starting to really understand that this whole thing is all about the up’s and down’s. You just really have to learn to role with the punches. 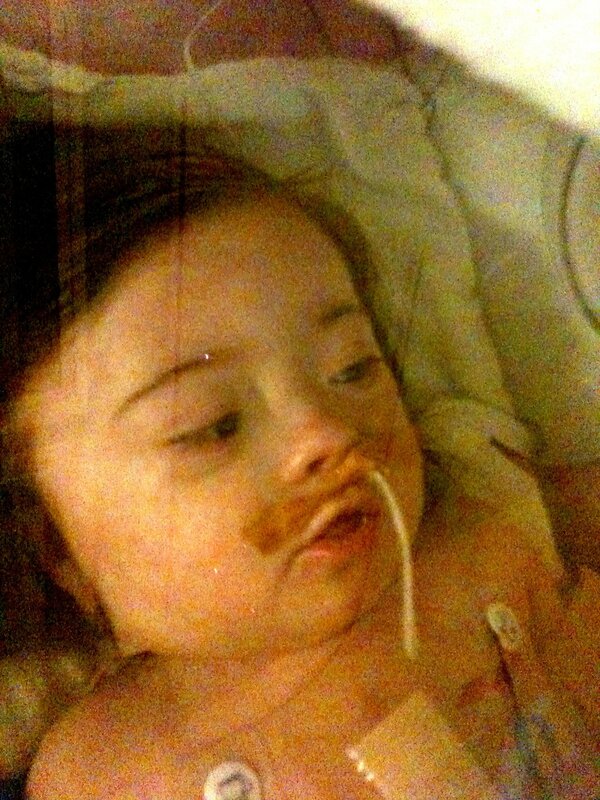 Somedays, like the day we got Lily’s chest tube out, are amazing from the moment you walk in the hospital doors. 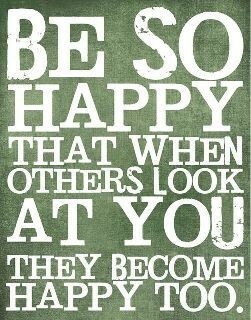 Others, like today, start optimistic and then drop pretty quickly and can feel incredibly overwhelming. But if you can focus on getting through that day’s adventure, then you’re still going to come out feeling like you’ve accomplished something (and by you, I totally mean Lily, but since she’s still totally out of it, we’re proud on her behalf). We also realized today (and have been realizing all along) that we’re incredibly lucky right now. Yes, with the diagnosis of the Pulmonary Vein Stenosis (PVS from now on) we’re in this game of “wait and grow” to determine what role this is going to play in Lily’s life and there is certainly a grim outlook on it when you actually search the term on Google, but for right now: this surgery, this recovery, we’re so very lucky. While Lily does things on her own time, we can still see some sort of progress every single day, and all around us there are kids and babies and teeny tiny babies, who aren’t so lucky and are struggling with things so much bigger than what Lily was going through: tiny babies having heart transplants, tiny babies being admitted because they’ve just been born and their mom’s are too sick to come with them; father’s who are torn between where to spend their time – it can really be a heartbreaking place to be. 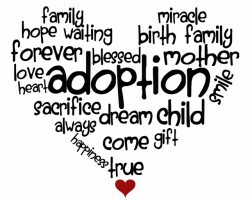 At least once a day you will walk down the hallway and run into a mom who is just sobbing like her heart is completely broken and you realize, sadly, that it probably is. So for tonight, we’re just so so so thankful that even though it’s not always an easy journey, we’re so lucky that it’s the one we’re on. Tonight, I’m thinking about Grayson and Baby Boy Green. For the first time in 4 days I got some amazing eye contact with our little Lily. After her Echocardiogram this afternoon she was very agitated and after some bum patting and an off-key rendition of Beautiful Boy by John Lennon, she was finally settled and very awake for the first time in days. I switched sides of the bed and there we both sat, for a good 10 minutes, just chatting and singing and soaking in those gorgeous eyes that I’ve missed so much. 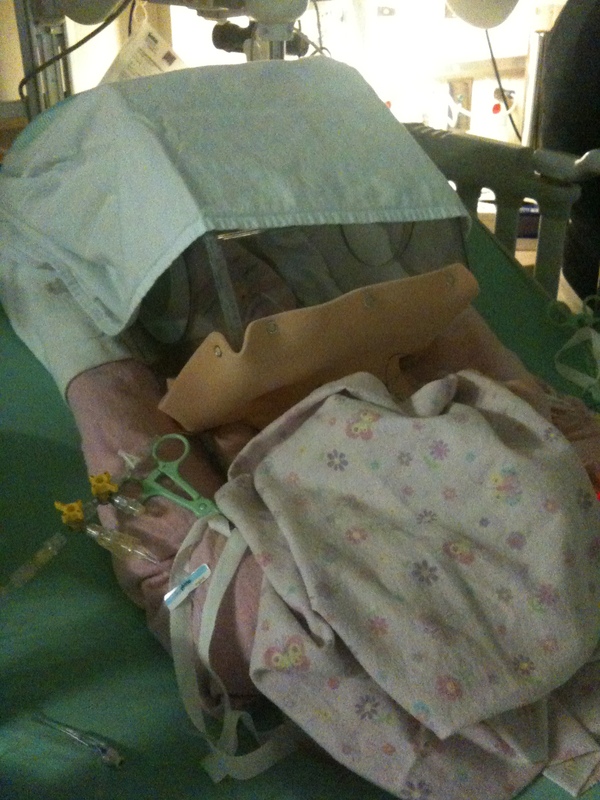 There wasn’t a lot of movement on the ventilator front: her oxygen levels still keep dropping when they try and lower the oxygen pressure, so they’re just doing it a lot slower than they had expected to. Her catheter is out though and the milking tubes that were draining fluid from her chest have been replaced by much smaller drains and the internal temperature line came out as well (although when they’re doing her temperatures rectally now, I’m sure she wishes it was back in). We even got to do a diaper change (this will probably be the only time that I’m excited about changing diapers). The new goal is to be upstairs in the cardiac wing before the weekend, so we can all have a relaxing weekend with just our little family in one room. Plus, if we’ve moved upstairs then it means that we’ll probably get to hold her too and I can’t even begin to tell you how much I want to be able to do that. 4 days with no Lily snuggles is way too long. They closed Lily’s chest today. I can’t even begin to describe the relief that Mommy and I both felt while we were standing in the middle of this group of doctors and heard them say her fluid output was finally high enough for them to close. We just kept smiling for a good 10 minutes while we just quietly celebrated the fact that we had reached this first milestone. The procedure itself was a success and done without any complications and her chest looks amazing – it just looks like a steri-strip is covering up a zipper. Her colour looks amazing – so pink and so much like a typical child. There’s no way to describe the difference, she just went from looking so pale, with tinges of blue when she got really upset to this bright complexion. It’s the most amazing thing I have ever seen. 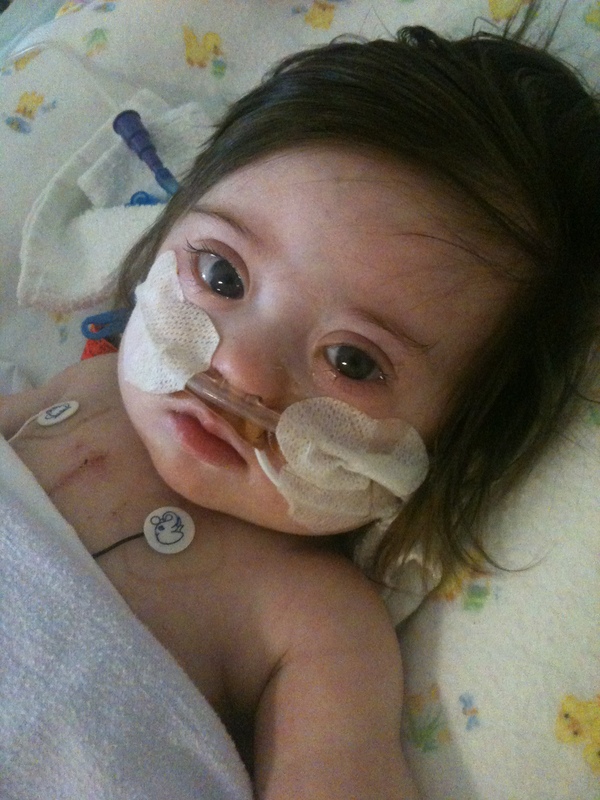 The next step is to wean her off of the oxygen ventilator that is doing a lot of her breathing work for her right now. 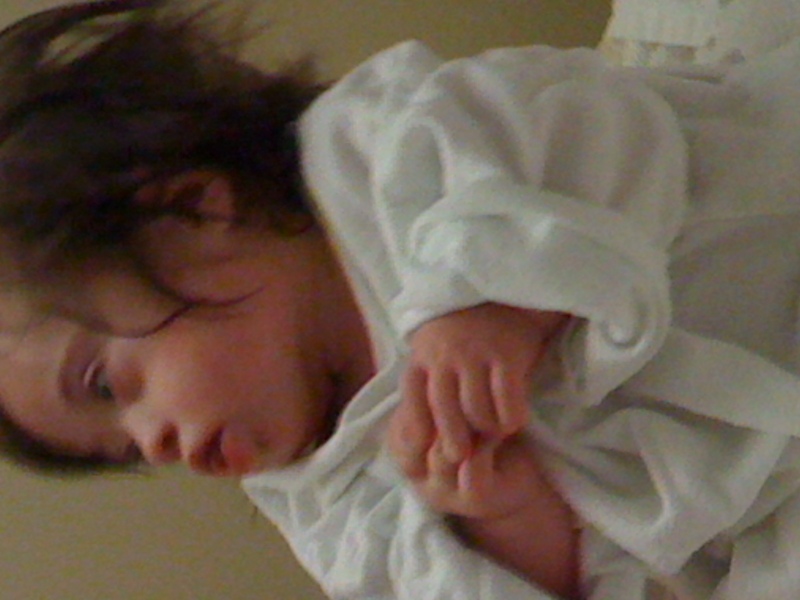 She still gets very agitated when she wakes up – very fidgety and her levels drop quite quickly. They were working on taking her off of the muscle relaxants and lowering her oxygen today and we didn’t have amazing results. The nurse had to give her a couple doses of Ativan to keep her calm (as opposed to sedated) and there was a lot of adjusting her oxygen levels, since they would drop quite low when she got agitated, but hopefully we’ll get on that track soon and the next step is moving her upstairs to the actual cardiac floor and into a step-down room (1 nurse for 2 kids, as opposed to 1 nurse per child). We’re working in baby steps, but since she actually is a baby, we’re pretty happy with that. It seems that Lily has a tendency to sleep and rest really well during the day and then get very agitated at night. We could have told them that she was a bit of a trickster, but we thought it would be more fun for them to figure it out by themselves. So, for the second night in a row, they needed to give her some extra sedation to keep her calm and rested. The real issue with her being agitated (beyond the fact that watching her like that is the most heartbreaking thing I have ever seen, especially with her breathing tube in and so she can’t actually cry) is that each time it happens, her stats drop significantly and she’s obviously not healing when she’s just trying to stay stable. Her fluid output was not as high as the doctor’s had hoped, her chest/abdomen is still quite swollen and her chest x-ray still showed a lot of fluid around her heart and so they decided that they would not try and close her chest today and would reassess again tomorrow morning. It’s certainly a frustrating process because it feels as though everything is just at a standstill. While I know that there is so much healing going on beneath the skin surface, what we are seeing is our little lady just being sedated and hoping to see some spark of our Lily. The nurses have been amazing – all of this weekend, they have been just a kind kind group of women, all working together to keep the 4 babies in that room healthy and strong. They each know all of the kids and check in on each of them all of the time. 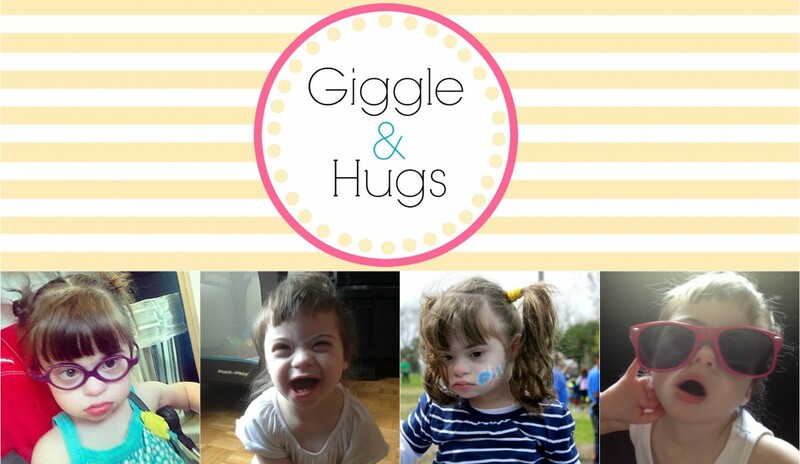 And they take care of the parents so well too – they’re constantly explaining everything that they’re doing, making sure that we don’t stand at the back of the room while the doctor’s are doing their rounds but keeping us front and centre so that we can jump in and ask questions. 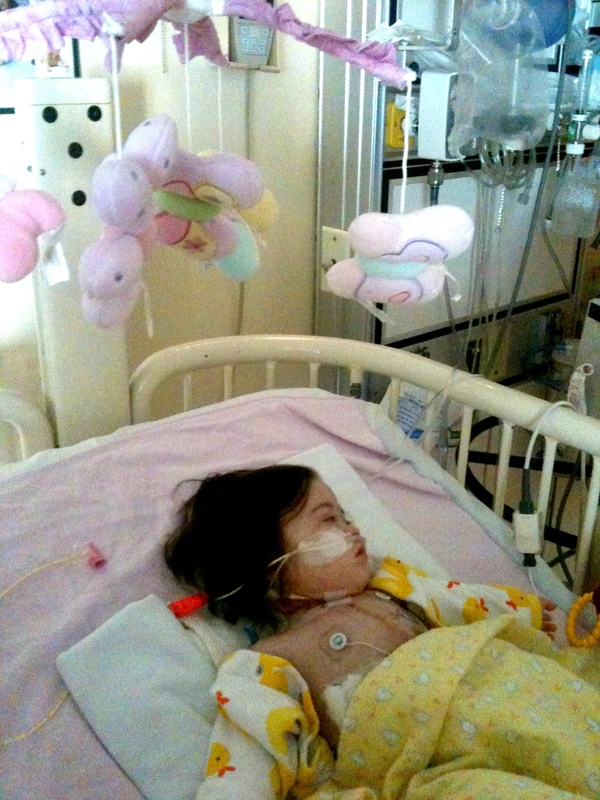 They encouraged us to bring Lily’s own things – her own blanket, her stuffed monkey – which I really think is more for parents, to see those comforting items, then it is for these tiny babies who are so sedated that they don’t know what’s really going on. They’re just an amazing group of women and I already feel so lucky that we’ve been part of this. 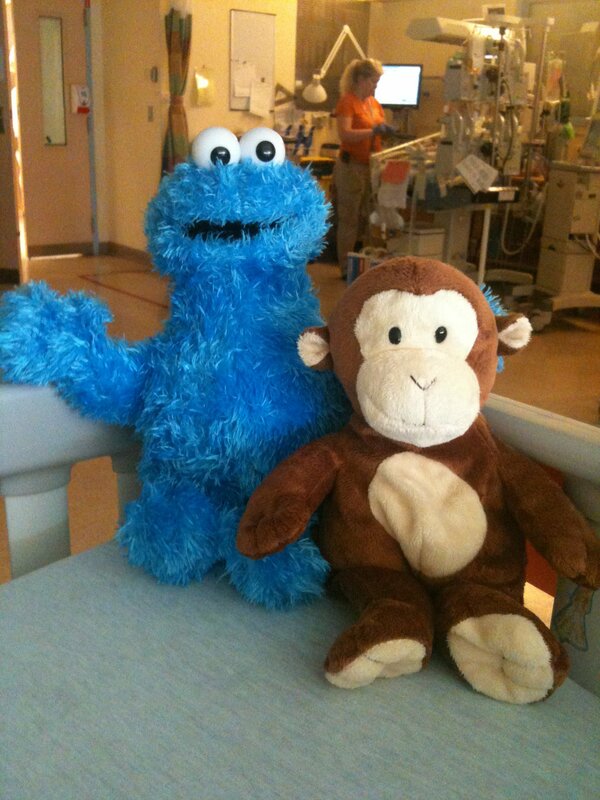 There is a reason that Sick Kids is the one of the most amazing hospitals in the world and the nurses are that reason. Day 2 went very well for Lily, although it ended up a little bit of a rough(ish) night. 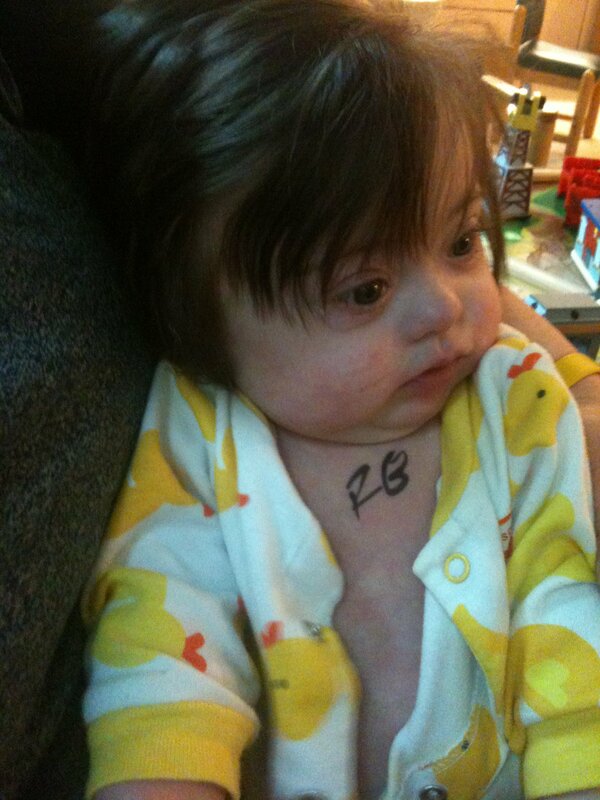 Ch ildren with Down Syndrome are apparently hard to sedate so she kept waking up and was obviously in pain. So the night nurse had to keep giving her extra sedation and morphine to keep her nice and quiet. The doctors were mostly happy with all of her levels throughout the night and morning, so as far as they’re concerned she’s stable – as stable as you can be with saran wrap holding your heart in your chest. 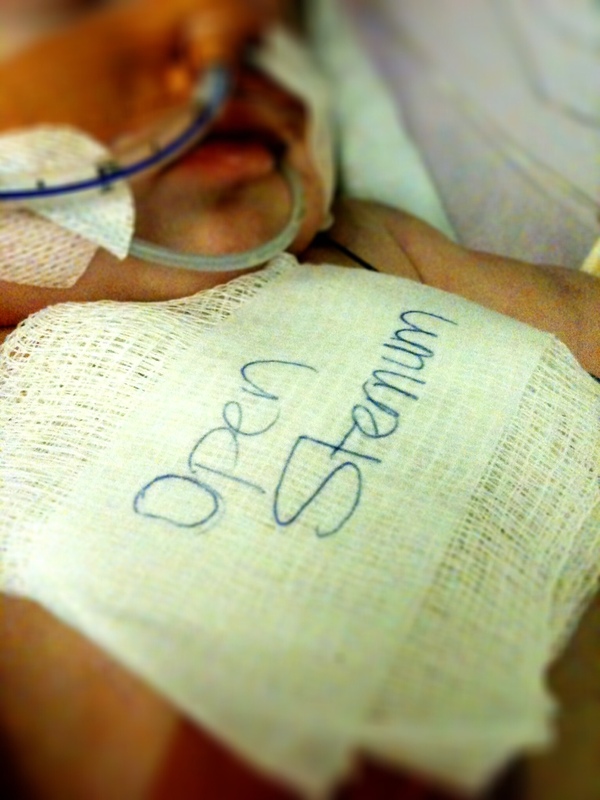 Seeing her like that, with a peice of gauze over the saran wrap, with the words “open sternum” written in slightly sloppy handwriting is completely odd. Mommy can’t handle looking at it, but I am constantly lifting up the guaze and am mesmerized by how strong her heartbeat is. When I start to get anxious, I just look at it and I’m reminded why we’re doing this and what it’s worth for her. The doctor’s looked at all of her this morning and decided that there was still too much fluid around the heart to try and close it today, so the goal was to keep her sedated so that she could rest completely and to increase the diuretic she’s taking so that this fluid can start making it’s way out of her. We’re really lucky that her surgeon is actually the surgeon on service this weekend, so we were able to see him for a moment this morning and he said that he thought she was doing well. The team will reassess during morning rounds tomorrow, and if they decide to go ahead – provided there are no emergencies to bump her – they will get started around 10am. The whole procedure takes about 3 hours (including prep and clean up) but it’s actually done bedside so that they don’t have to send her back to the OR. Keep your fingers crossed for a night full of pee! Our nurse today was really amazing and realized that we hadn’t been shown the inner-workings of the CCCU. So, she explained when the best ti me was to be around each day to catch the doctor’s on their rounds, which is the perfect time to ask any questions. Before Mommy arrived, she told me about the parent showers and the washers and dryers for parents as well. She showed us the parent room in the CCCU – the fridge, microwave, and movies (for older kids!). 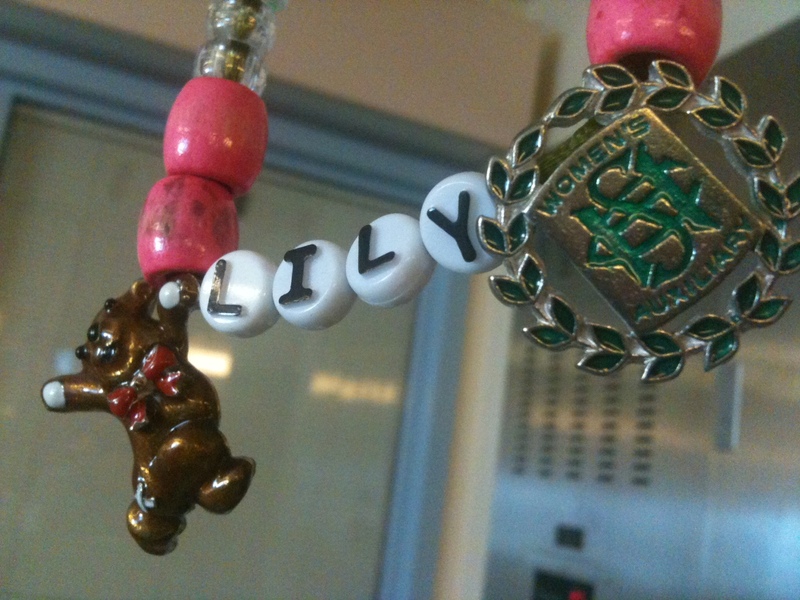 Then, as things slowed down a little bit, she also got Lily started on the Bravery Bead program – although it was a little sad to see how many beads she got just for this surgery alone: EKG, Blood Transfusion, Surgery, Tube Insertion (it feels like there are 10 of those!) It’s an amazing program and I hadn’t realized that they literally start where they’re so small. Until she’s old enough to wear it, it’s hanging on her IV pole – and hopefully will remind the 2 mom’s just what a tough fighter this Lily is. You take the good, you take the bad…. Today was the longest day of my short little life. After bothering me late last night to have that silly bath, the mom’s woke me up at 5:30am this morning, so that I could have some water, change my diaper, put on clean sleepers and then they pulled my tube out. It was all so fast that I barely even noticed most of it and before I could even really cry about the stupid tube, we were in the car and on our way to Sick Kids. When we got there, we went straight up to the cardiac floor and got me all checked in and the super amazing nurse Cathy, showed us to my room, but not before I met one of my surgeons and he drew his initials on my chest (I’m not sure why, but I guess it was to make sure they didn’t operate on my head or my leg by mistake). A lot of the nurses on the floor remember me from my first operation and were so impressed with how much I’ve grown and how long my hair is. Once the oogling ended though, the mom’s made me suffer through another surgical bath, changed me into my hospital pajamas and then I promptly fell asleep while Mommy rocked me in a chair. I woke up again when we were walking down the the waiting room and several more people told me how adorable I was before some new nurse lady made me say “see you later” to the mom’s and off I went. I stop remembering what happened then because they gave me a whole lot of drugs, so I’m going to turn this blog post over to Mama C, who can tell you the rest of the story……. Lily’s surgery wa s scheduled to last 5 – 6 hours, including preparation and closing. Mommy and I had a very long morning and afternoon of waiting and waiting and waiting, getting more anxious with each hour, but luckily with some very kind guests – my mom with Jason and Theresa, who kept us from actually going insane. 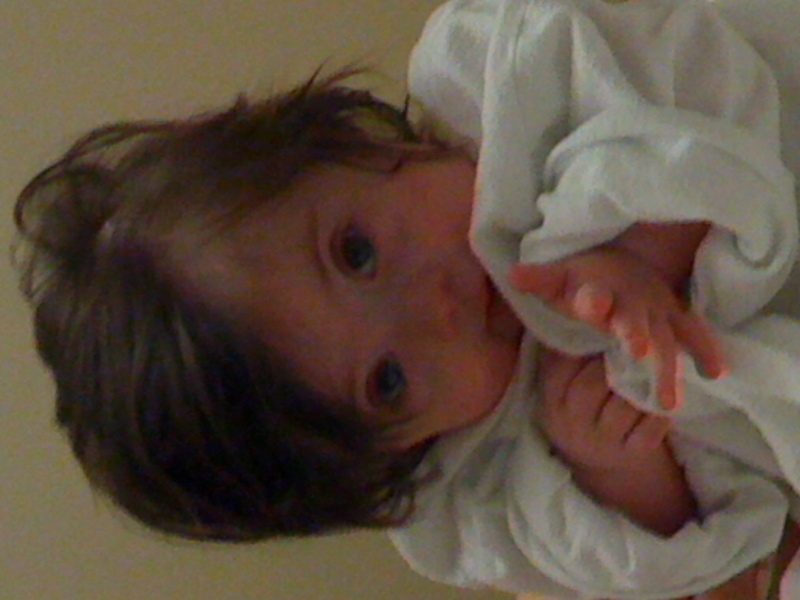 Finally around 3pm, Lily’s surgeon came out and found us to give us an update on her. The repair of the AVSD, which was supposed to be the main part of the surgery, was done without complications and they were really happy at this point with the results. They were able to remove the bands that were helping the blood flow through her aortic valves and generally entire peice of the surgery was done very well – no need for a pacemaker and the heart was beating well. Unfortunately, at this point, he did go on to tell us of a complication that they hadn’t been expecting. Apparently, on one of the EKG’s that had been done, they noticed some narrowing of one of the pulmonary veins on her left side (the veins that bring blood from the lungs back to the heart). They had thought at the time that it didn’t look very severe but they wanted to take a look at it and make sure. When they saw the veins in person, the story was much different. Each lung, the left and the right, have 2 pulmonary veins that all lead back to the heart (4 veins in total). The veins on Lily’s left side have significant narrowing. 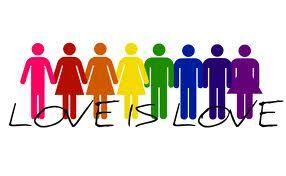 , which means the heart has to work harder in order to get that blood to move. 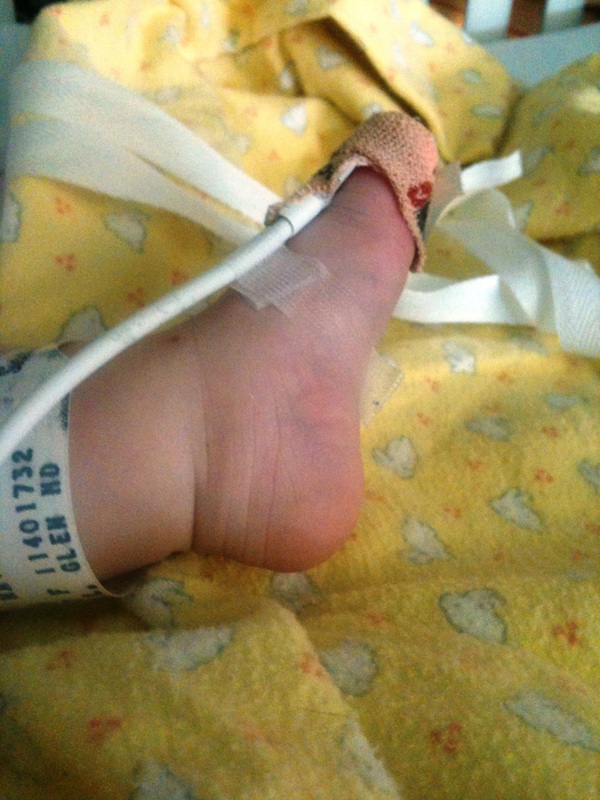 Lily’s surgeon tried to get in to widen each of the veins, but there wasn’t a lot of success – one of the veins is blocked completely and the other one is narrowed quite significantly. The surgeon didn’t give us a lot of information at the time because I’m sure we looked completely overwhelmed so we don’t have a full understanding of the long term implications of this yet, but we know that it’s not fantastic. We had to wait for the surgery to finish and for Lily to get transferred to the Cardiac Critical Care Unit and get stabilized before we were allowed in see her. Because the surgeon spent extra time working on her veins, her body was exhausted by the end of the surgery, that they didn’t want to put her through the extra stress of closing up her chest. So, right now, her chest is still open and the surgeon is waiting for a couple of days to let her build back up her strength before they close her back up. 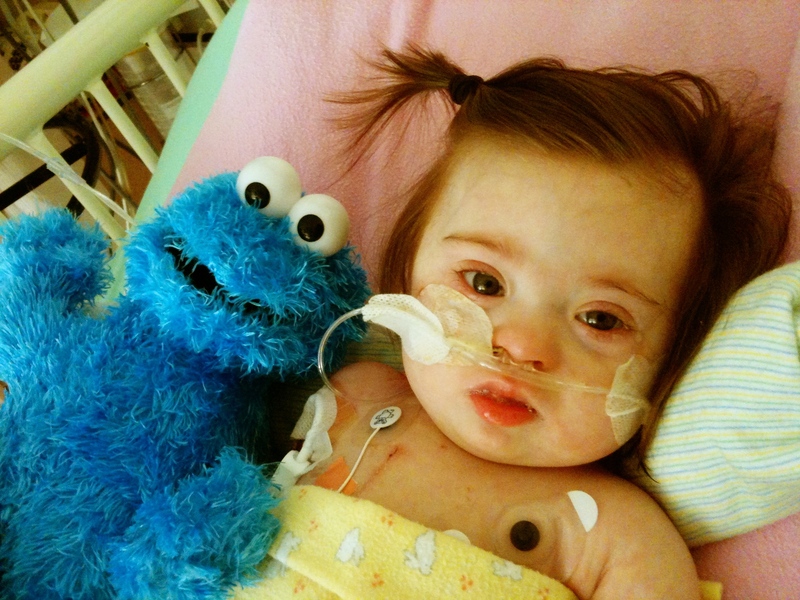 They can do it right at her CCCU beside, which means she won’t have to endure another surgery to have it closed. It has been an incredibly long day and now Mommy and I are back at home, just having a quick dinner before we go to bed, try and get caught up on some much needed sleep before we head back to see her in time to see the doctor in the morning.